Strings DirectGuidesAre my strings wearing down my frets? Hello and welcome back to the next instalment of the Strings Direct blog. In this entry, we’re going to talk about the relationship between your frets and your strings and in particular how they can affect one another. Your frets and your strings are like two best friends. They have a very close relationship… after all, they make contact with each other every time we play our guitar. However, whilst these two parts of the guitar are best buds…like many friendships, they can sometimes rub each other up the wrong way. If you’ve ever taken a close look at an older, well-played guitar, you may have noticed some worn frets. This typically manifests itself as small indentations or dips on the top surface of the fret that develop over time. You could say that some players see this wear and tear as a ‘badge of honour’ …a symbol of the time, blood, sweat and tears dedicated to their instrument. 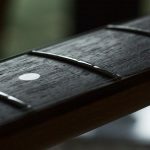 We’ve mentioned in previous blogs that our frets play a huge role in the playability of our instrument, so it’s important to keep an eye on them, whether this is through general cleaning and maintenance or regular visits to your local repairman to ensure they are kept in optimum playing condition. But what causes frets to wear down? 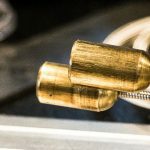 Why do some players seem to constantly need attention to their guitar’s frets and are your strings the main cause of the issue? Below we’ll try to tackle a few of these questions with a bit of a geology lesson along the way for good measure. 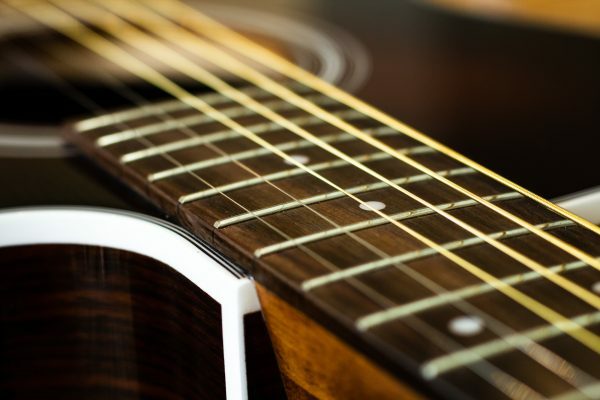 Before we delve a little deeper into this topic, we need to understand a bit of theory surrounding the types of materials used for frets and strings. Different metals have different properties and in particular, they will have a different ‘hardness’ associated with them. In this instance, when we talk about ‘hardness’ we’re referring to the metal’s resistance to scratching and wear. Naturally, some metals are more resistant than others. For instance, copper is a ‘soft’ metal and tends to scratch easily, whereas, something like titanium is extremely hard wearing. To quantify this, there are official ‘hardness’ scales available to help us out. One in particular was developed by a German Mineralogist by the name of Friedrich Mohs back in 1812 and is aptly named the Mohs Scale (modest chap!). As part of his discoveries, Mohs gave each mineral a rating out of 10 and this figure represented its level of ‘hardness’. 1 being the softest (most easily scratched) and 10 being the hardest and most resistant. Mohs’ tests were originally carried out on minerals, however, this ranking system is still used today and applicable to metals allowing us to see how they compare against one another. Incidentally, it is worth noting that materials with higher ratings will ‘scratch’ materials with lower ratings. So a metal with a rating of 7 will cause wear to a mineral rating of 3, but not the other way around. Thanks for the Geology lesson, but what does this mean for my guitar? Good question! Well, these principles are particularly useful as we can now use these findings and begin to make more sense of the relationship between our frets and our strings. First, let’s take a look at our frets…. Frets can be constructed from a variety of different materials. One of the leading manufacturers of frets in Europe is a company called Sintoms, based in Belarus. These guys manufacture frets using a host of metals but one of the most popular materials used today is Nickel Silver. The term Nickel Silver is actually a bit of a misnomer as these frets actually contain no silver, but comprise of 18% Nickel and 80% Copper with a few specks of other elements thrown in there to make up the other 2%. Nickel has a figure of 4.0 on the ‘hardness’ scale which whilst it doesn’t sound very high, it is a great option for fret material as it is in fact pretty hard wearing and easier to shape and fit to fingerboards in comparison to other harder materials. The other common metal used to make frets is Stainless Steel. Depending on it’s exact composition, Stainless Steel usually has a hardness rating of around 4.5-5. Whilst it doesn’t sound like a huge difference, Stainless Steel frets are in fact a lot harder wearing than Nickel frets and as a result, don’t tend to wear nearly as much. In fact, according to Sintoms, their Stainless Steel frets are ‘practically ageless.’ It’s worth bearing in mind that whilst these frets withstand a lot of wear, their strength can make it more difficult to shape and fit to curved fingerboards so a bit more time and attention is usually required during the installation process. 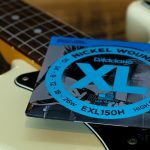 If you are accustomed to carrying out your research on guitar forums, you’ll no doubt see plenty of threads discussing the tonal differences between Nickel Silver and Stainless Steel frets. Generally speaking, Nickel Silver frets will have a softer feel and warmer sound, whereas Stainless Steel frets have a harder feel and can help deliver a brighter, more zingy tone. Although this may be the case, it’s worth bearing in mind these differences are subtle, so if you’re looking for that tonal edge and considering changing your frets simply for the sake of doing so, this adjustment may not necessarily get you that much closer to tonal nirvana. The material of the frets is just one element in this equation and it’s important for us to take a look at string material too. As we know, strings (whether they be for electric guitar, acoustic guitar, basses or any other instrument) can be made from a variety of different metals as well. Many ‘plain steel’ strings found in electric sets are manufactured using high carbon steel. As we learnt earlier, steel has a rating of approximately 4-5 which is harder than the Nickel Silver frets found on many guitars nowadays. As a result, you’ll find that plain strings will cause gradual wear to a ‘softer’ fret. If you take a look at a guitar that shows signs of fret wear, you may notice that there tends to be more wear located on the treble side located just underneath the plain strings. You will also find that the wear isn’t always consistent across all the frets, in fact it can be concentrated around different areas of the neck where most of the playing takes place (Blues in A anybody?). Not to mention, plain steel strings are the ones that are bent the most and have the majority of vibrato applied to them. You only have to visualise the motion involved in bending and vibrato to see that a ‘harder’ string moved across a ‘softer’ fret will have an affect. Most acoustic sets will use the same high carbon plain steel strings for their treble strings. There are variations in this, for instance, some sets use brass strings. Brass is mainly made up of copper and zinc and both elements have a hardness value of less than 4 so these brass plain steel strings won’t necessarily cause any trouble for your frets. Our in house guitar technician Chris Ward observed that most wear found on acoustic guitars is usually located around the first few frets as this is where the majority of playing takes place i.e. open position chords. Chris also pointed out that acoustic guitars tend to have a higher action in comparison to electric guitars and as a result more effort is required to press the strings down. 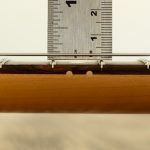 This extra force exerted on the string means it can result in a greater level of fret wear, however, many acoustic guitars show little to no wear in the higher registers of the neck and if new frets are needed, it’s usually only the first five frets that need replacing. So what about the wound strings? As we’ve discussed in previous blogs, popular wrap wires include Nickel Plated Steel,Pure Nickel, Phosphor Bronze, and 80/20 Bronze. The hardness of many of these alloys falls between the ratings of 3-4.5 so depending on the set and the frets on your guitar, there shouldn’t be too much excessive wear. One of the most significant string materials to be aware of is stainless steel. As we’ve learnt, Stainless Steel is hard and will certainly cause wear to frets made from a softer material such as nickel. Whilst Stainless Steel sets are used by electric guitar players they are more popular with bass players as they help to add brightness to a mellow bass tone. It’s worth pointing out that if you did wish to change over to stainless steel frets, be aware that your frets could be ‘harder’ than the material of your strings. Consequently, the frets could reduce the lifespan of your strings faster than normal. Are there any other factors that may be causing my frets to wear down? A significant point to consider when looking at fret wear is how hard you press the strings down. Players that play with a bit more gusto and those that tend to squeeze the strings a little harder may find their frets are more susceptible to wear over time whereas those with a lighter touch may never need any attention to their frets during their lifetime. Arguably, even the gauge of the strings you use can have an effect to some extent (the higher the gauge, the more wear they can cause). 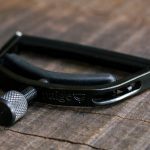 In a similar vein, capos can contribute towards premature fret wear. Most capos tend to clamp down on the strings a lot harder than you would normally fret the string. This is especially true if your capo doesn’t have the function to finely adjust the tension which in many cases can be excessive and will inevitably have a detrimental effect on your frets over time. How often you play is another telling factor. The professional that plays for 8 hours a day will of course experience more fret wear than the enthusiast that picks up their guitar for a brief strum every now and then. We hope that this article has given you a better insight into the relationship between your frets and strings and offered up some solutions as to how they can affect one another. There are plenty of factors to take into consideration here and if you have any questions or thoughts of your own on this topic, we always encourage our readers to leave us a comment below. We love to hear from you all. As always, thanks for reading and we will see you all next time. Hi, how does the capo cause extra wear as it holds the strings still at the fret, albeit by pressing them down. Many thanks for this and all your other blogs which I always find a very welcome distraction. Yes, and some players leave a capo semi-permanently on the instrument even when put away in it’s case. Hi guys, this is an extremely interesting subject for guitarists and I can’t help thinking how it might be a good idea to describe the hardness of a particular set of strings as well as the type of metal used. My preference would be to change the strings more often as a pose to wearing the frets with harder strings. Hi Glenn, thanks for your comment. Where possible in our listings on the site we will always try and provide information on the material used for the sets. This information is not always provided as ‘in depth’ as we’d like from the suppliers. That being said, a good idea, we will certainly look to add that into our listings to give you guys an idea of where a certain material sits on the ‘hardness’ scale. As someone who’s just had their beloved old Martin refretted (again!) I’d just like to thank you for a very interesting and informative article. I enjoy reading the articles that you produce, thanks for taking the time and trouble to write them! Hi Simon, thanks very much. You’re welcome. What sort of wear would you expect to see from flatwound strings? I’m using Thomastik JS111T Jazz Swing Flatwound 11-47 on a Cort M900 . Hi Graeme, that is a good question. Admittedly, we haven’t actually tested the difference between the two, however, if there was a difference you will probably find that the windings on a round wound string may cause more of a ‘grating’ effect against the fret and could dig in more as opposed to a flatwound string. The Thomastik JS111T strings consist of plain tin plated treble strings and Pure Nickel wound strings. Inevitably, they will wear the frets over a longer period of time but they shouldn’t cause noticeable wear to normal Nickel Silver frets as the two materials are more or less the same hardness as one another. Coupled with them being flatwound too. Hi this is not a lot to do with frets. I play a strat and I want to find strings that give me bite on the lover strings and mellow on the top strings. I have lowered the pickups on the treble side which helps lower the treble volume but they still scream too much for my liking. I use 10-46 gauge. Can recommend strings that will achieve my objective. This isn’t going to help – good start, eh? When I had Vincent motorcycles (stay with it, it’s relevant) the forks had steel spindles that ran in some relatively soft bronze-type porous bushes called “oilite”. Over the years, they wore huge grooves in the much harder spindles. So I guess less hard strings won’t necessarily wear frets less . . . . . maybe don’t rush off to buy a Brinnell hardness tester, then. A vice-like grip and three-semitone bends or a light touch will probably make more difference that materials – unless you have frets made from melted-down NAAFI teaspoons . . . .